As overnight successes go, fifteen years is a hell of a long time to wait. While a fortuitous 1979 meeting in a student house in Cardiff would set Rick Smith and Karl Hyde on a collective career path for the next thirty five years (and counting), it would be a decade and a half before they were heralded as the most important new band in Britain with a ‘debut’ album so groundbreaking, its ripple effects are still apparent now. In the years after meeting, bands came and went – the Screen Gemz, Freur, Underworld (Mk 1). A relocation to Essex, a curious ear to the country’s nascent club scene and a meeting (engineered by Rick’s brother-in-law) with 19 year old DJ Darren Emerson helped inspire total creative rebirth. Each would bring a unique contrasting vision to Underworld. Rick would explore the infinite possibilities of studio as instrument, Darren would help inspire left-turns in the creative process while Karl would trawl late night city streets documenting fragments of conversation that would eventually provide elliptical lyrics. A series of jaw dropping singles by the trio followed. Tentative steps were taken under the guise of Lemon Interupt (Big Mouth, Dirty) before three releases under the reclaimed Underworld moniker (Mmm… Skyscraper I Love You, Rez, Spikee) paved the way for the band’s first album, released at the start of 1994 to unanimous praise. A glorious, mesmeric tumble of information, dubnobasswithmyheadman occupied a truly inimitable musical space – one where discombobulated phrases looped hypnotically and rolling lyrical travelogues stretched themselves out over an entirely new sonic architecture; a place where the narcotic haze of Studio One fused to the Europe Endless techno underground. Designed by Tomato, the art cooperative Smith and Hyde had helped establish in the early ‘90s, the record came packaged monochrome, plastered in graphic distortion. As a statement of intent, as arresting a piece of sleeve art as anything released in that decade. In the twenty years since the release of dubnobasswithmyheadman, Underworld’s DNA has spread through both electronic music and popular culture in general – mutated and reimagined as the EDM soundtrack of the dancefloors of Las Vegas; acknowledged and acclaimed as the backbone to Danny Boyle’s production of Frankenstein at the National Theatre and his globally acclaimed Opening Ceremony to the London 2012 Olympic Games (where Smith and Hyde – back to a core duo after the departure of Emerson in 2000 – acted as musical directors to an inspired, hallucinogenic sprint through three hundred years of British history). Their albums – from the gleaming futurism of Second Toughest In The Infants (1996) to Barking’s gleeful exploration of modern dancefloor sonics (2010) – effortlessly filtered modernist sounds into their own ever-expanding vision. On stage, they established and cemented a reputation as one of the most forward thinking, freeform electronic acts in the world; their gigs – whether in clubs, gig venues or on festival stages – created a communal euphoria unparalleled in live ‘dance’ music. Following work on the Olympics, Smith and Hyde took time to work on solo projects. Hyde’s beautiful, ruminative solo record Edgeland dwelt in the connective sprawl between the city and shires while his work with Brian Eno (on the brace of albums Someday World and High Life) explored African polyrhythms and European electronics with a remarkable team of handpicked musicians (including Roxy Music’s Andy Mackay and Coldplay’s Will Champion). Smith’s score for Danny Boyle’s 2013 film Trance reimagined the heist movie score as something gleefully frenetic, claustrophobic and addictive. Reuniting with multi-award winning singer Emile Sande following their collaboration for the Olympics, Smith created Here It Comes, a shimmering Balaeric groove that recalled the Underworld classic Eightball. Together, they created a bespoke in vehicle sound installation for car giant Volkswagen. Called Play The Road, it offered intuitive response to motion and speed; as much a vision of the future of road travel as it was of music. Summer 2014, Smith and Hyde announced the re-release of dubnobasswithmyheadman alongside a one-off performance of the album at one of London’s most prestigious venues, the Royal Festival Hall. Demand for tickets saw the Festival Hall’s phone system melt down; in real terms, the gig sold out in the first ten seconds it was on sale. Proof then that thirty-five years after forming a band and twenty years after being heralded as the best new thing in town, it’s still possible to be an overnight success. 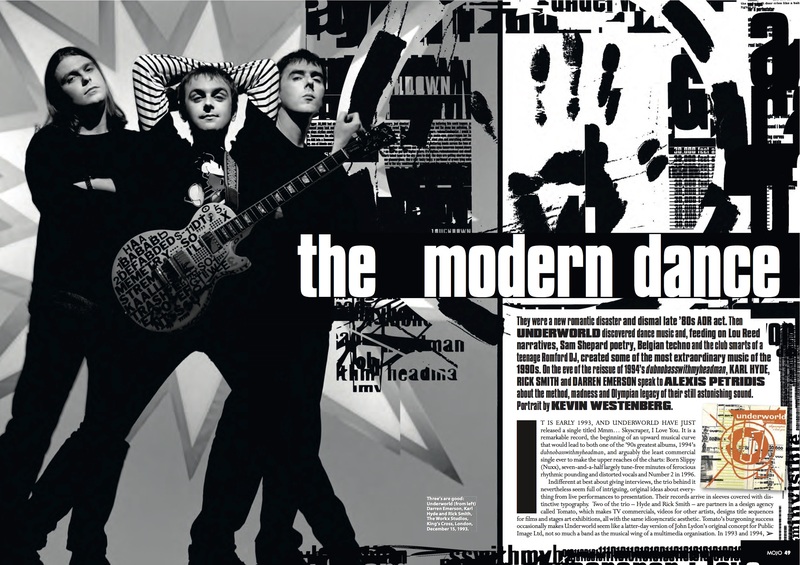 Robin Turner has worked with Underworld since 1994 when he was taken on as the press officer for dubnobasswithmyheadman. Turner Hall are honoured to work with the band on the reissue campaign, gigs and future projects.